South Korean technology giant Samsung has launched its Galaxy A2 Core smartphone in India. The Samsung Galaxy A2 Core smartphone is an entry-level offering from the company that is aimed at first-time smartphone users and runs Android Pie (Go Edition). The handset is the successor of Samsung Galaxy J2 Core that the company launched in August 2018. According to IANS, Ranjivjit Singh, Chief Marketing Officer and Senior Vice President of Samsung India, Samsung Galaxy A2 Core is priced in India at Rs 5,290. The smartphone can now be bought via offline channels, according to renowned retailer Mahesh Telecom. However, as of now, there is no word from Samsung India about when the handset will be available via online channels in the country. 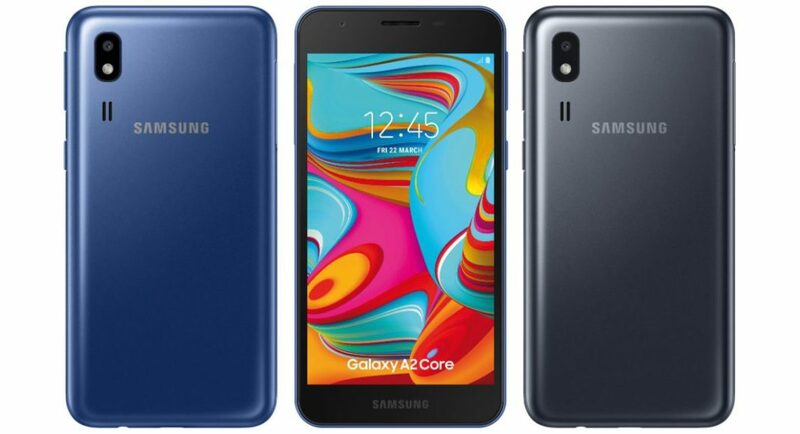 Coming to the specifications of the entry-level Samsung Galaxy A2 Core smartphone, according to an image that was shared by Mahesh Telecom, the device features a 5-inch qHD (960×540 pixels) display and is powered by an octa-core Exynos 7870 processor. The newly-launched smartphone comes with 1GB of RAM and 16GB of internal storage. As we mentioned earlier, the handset runs Android Pie (Go Edition) and houses a 2,600mAh battery. For imaging duties, Samsung’s new offering has a 5MP primary camera on its back panel as well as a 5MP sensor on its front panel for selfies and video calls. The connectivity options of the Galaxy A2 Core handset were not mentioned by Mahesh Telecom. However, according to a leak that surfaced online last month, the device comes with include 4G LTE, Wi-Fi, Bluetooth v4.2, GPS, FM radio, Micro-USB port, and a 3.5mm headphone jack. The dimensions of the dveice have been said to be 141.6x71x9.1mm and the device weighs 142 grams. Since the smartphone comes with Android Pie (Go Edition), it will come pre-installed with a number of apps that are optimised for Android Go like Google Assistant Go and Maps Go. Another leak mentions that Samsung has launched the device in Blue and Black colour options. In addition to this, a leaked user manual has also revealed that Samsung Galaxy A2 Core will be made available by the company in a single-SIM as well as a dual-SIM variant. However, it is not clear as of now which one among the two is available in the Indian smartphone market.